Robin Nolan and Stefan Sonntag met at the North Wales Summer School 2007 in Wrexham/North Wales. 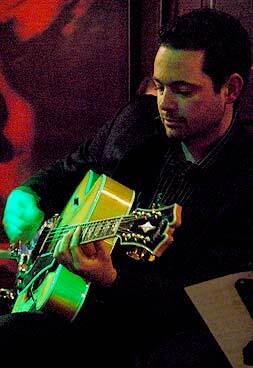 Robin was booked as a lecturer for a Gypsy Jazz Master Class. Despite being known as a Maccaferri-type player, Robin played on a Sonntag J17H Standard throughout the festival, even on the public evening concerts. To cut a long story short, before leaving the festival Robin ordered his own J17H Standard which he could lay hands on in March 2008. 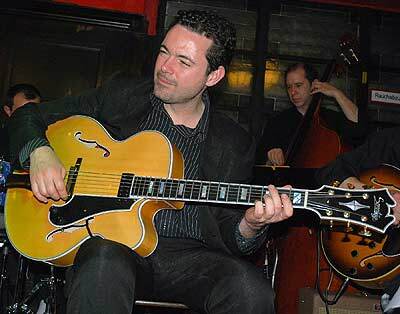 Robin Nolan has his musical roots in the Gypsy jazz music. But in the course of the years he managed to develop a complete unique style of playing guitar. Meanwhile he is touring worldwide and has played with lots of big names of the jazz guitar szene, such as David Grisman, John Jorgenson, Howard Alden and others. He was invited to many renowned jazz festvals, such as the Montreal Jazz Festival, the Barcelona Jazz Festival or to George Harrison's private events. Robin was also booked as tutor for the 4th International Jazz Guitar Workshop in Aiguéze/South of France 2008, held by Sonntag Guitars. Robin Nolan improvises an intro on his J17 Standard.